Real, inflation-adjusted interest rates are still negative in the U.S. Negative real interest rate environments lead to dangerous bubbles. 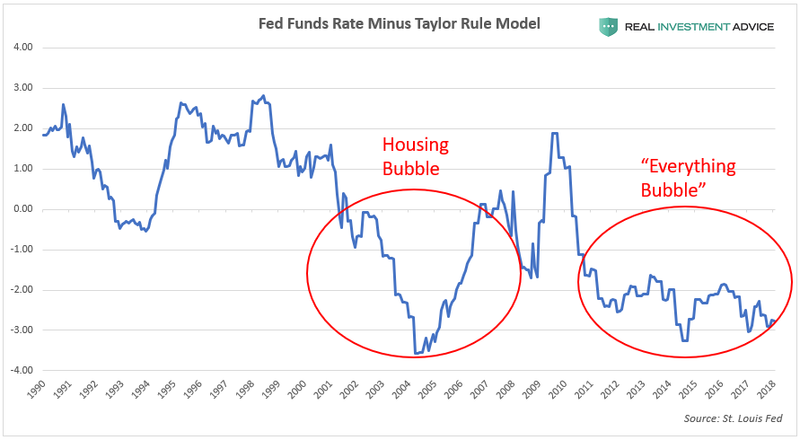 The stock market bubble will likely keep inflating as long as real rates are negative. The S&P 500 hit an intraday record of 2,876.16 on Friday, surpassing its January 2018 peak that occurred before the violent 12% correction that ensued in February. The official reason for Friday’s bullish action was Fed Chairman Jerome Powell’s speech in which he outlined his expectations for gradual interest rate increases. Powell’s speech didn’t contain any new information, and that’s exactly why the market rallied – “no news is good news.” On Monday, the rally continued as the S&P 500 hit another record of 2,898.25. 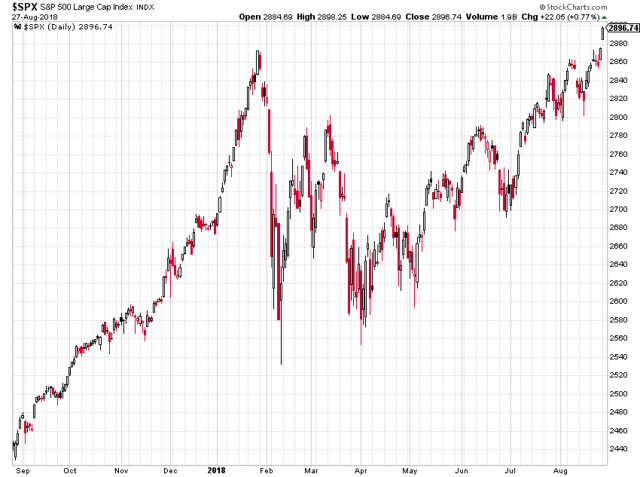 Why has the S&P 500 been able to surpass its January high despite ultra-high stock valuations, trade wars, an unfolding emerging markets crisis, and more? This is not a popular explanation, but it is largely due to the fact that U.S. monetary conditions are still very loose despite the rate hikes of the past couple years. 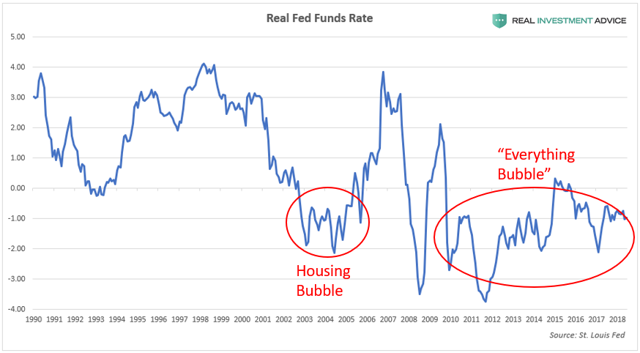 As I’ve discussed recently, record low interest rates are the primary reason for the U.S. stock market bubble. The chart below shows how U.S. interest rates (the Fed Funds Rate, 10-Year Treasury yields, and Aaa corporate bond yields) have been at record low levels for a record period of time since the 2008 financial crisis. 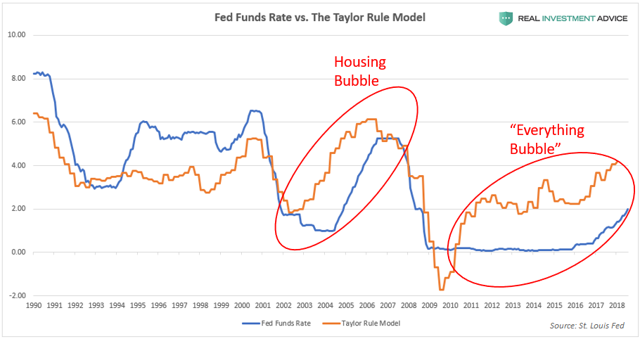 The chart below plots the difference between the Fed Funds Rate and the Taylor Rule model to show when U.S. monetary policy is likely too tight (when the chart is in positive territory) or too loose (when the chart is in negative territory). Both the U.S. housing bubble and the current “Everything Bubble” formed when the difference between the Fed Funds Rate and the Taylor Rule model was negative (the Fed Funds Rate was lower than the Taylor Rule model). As long as U.S. monetary conditions are still very loose, there will be a general tendency for the stock market bubble to continue inflating, which means that the final unwind will be even worse. The Fed will likely continue hiking interest rates until the real Fed funds rate is neutral or positive again, which will then contribute to the bursting of the stock market bubble.